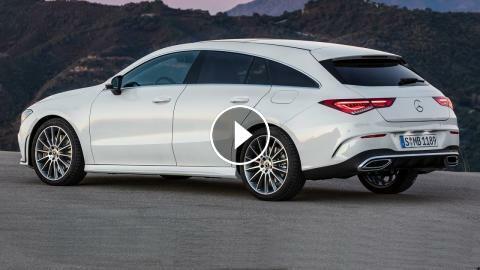 Americans still aren't too keen on wagon body styles, and that likely makes the 2020 Mercedes-Benz CLA Shooting Brake off limits stateside. However, the compact wagon made its debut at the 2019 Geneva International Motor Show on Tuesday where it will join the CLA sedan in Europe. The CLA Shooting Brake is aimed at customers who perhaps wouldn't put Mercedes-Benz on their vehicle shopping lists. The CLA-Class is a stepping stone into the luxury brand, and the CLA Shooting Brake provides more space for drivers and passengers and their cargo. The coupe-like look of the CLA sedan translates well to the wagon with a long hood up front and wide hips at the rear. The compact greenhouse also retains the "four-door coupe" ethos. Like the regular CLA, the wagon largely lacks side character lines, which lends a softer look. Compared to the previous CLA Shooting Brake, the car is longer and wider, 1.8 and 2 inches, respectively. Head room and leg room increase marginally in the rear with the added inches. Mercedes-Benz also took care to increase the rear hatch opening a considerable 9.3 inches to make loading cargo easier. The CLA Shooting Brake hardly looks entry-level inside. The same wide touchscreen is present from the regular CLA and new A-Class, complete with the MBUX infotainment system. Materials look wonderful and the bright yellow accents shown with the yellow exterior color provide a generous splash of color to the black and silver upholstery and trims. The CLA Shooting Brake also features an Energizing Coach. If the driver has paired his or her Mercedes smartwatch or compatible smartwatch to the car, the "coach" will read the driver's wellness levels and adjust controls inside the car to ensure a pleasurable drive automatically. Under all the premium goodies is a sportier suspension setup compared to the CLA sedan or A-Class. Adaptive damping allows the driver to swap between comfort and sport tunes. Meanwhile, the CLA Shooting Brake is an aerodynamic machine with a drag coefficient of 0.26, which isn't too far behind the CLA's 0.23 figure.